A few years ago, I traveled to Pisa. It was a pilgrimage of sorts since I have always had a fascination with the cathedral’s belltower. The tower is famous around the world because its construction was flawed almost from the moment it began in 1173 AD. Even by the time the second floor was completed, it had already begun to sink. 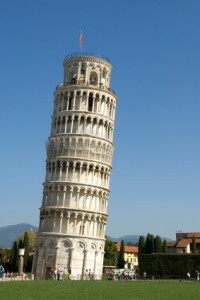 Standing among the tourists, who endlessly posed friends so they would appear to be supporting the leaning tower in photographs, my mind could not help but reflect upon Galileo. The steps up the tower are well worn from use over the centuries, and I was mindful that Galileo himself had walked them. And when I was at the top of the tower, I moved to the edge so I could imagine dropping balls of different weights over the edge and watching as they hit the ground at precisely the same time. The story of Galileo’s famous experiment, in which he was said to have dropped two balls of very different weights over the edge, was a decisive demonstration of the falseness of the Aristotelian theory of gravity, which held that objects would instead fall at a speed in proportion to their mass. In August, 1971, the experiment was dramatically repeated on the moon by David Scott (the Commander of Apollo 15) using a hammer and a feather. Video of that demonstration can be found here. While many historians question whether Galileo ever actually performed the experiment himself, he remains forever associated with the fundamental commitment of science to the consequences of observable data. He was the one, after all, who pointed his telescope towards Venus and Jupiter to confirm with the evidence of his own eyes that we do not live in a geocentric universe. The fact that others refused even to do something so simple as to look for themselves could never change the reality of the structure of the solar system in which we exist. Galileo is often elevated by scientists to the status of hero because his commitment to observation and his challenge to orthodoxy were made dramatically in the face of persecution by the Catholic Church. The consequences of this status are at times inconvenient and frustrating — every crackpot who invents a perpetual-motion machine imagines himself to be another misunderstood Galileo. Most of them are not, of course, but the status of hero for Galileo remains well-deserved as a reminder that science must always be prepared to accept challenges. That is its very strength and is responsible for the amazing strides in knowledge that it has allowed. This week, the Tennessee Senate passed SB 893, a bill that has been widely characterized as allowing the teaching of creationism in schools. A copy of the text of the bill can be found here. While I have no doubt that passage of the bill is viewed as a success by the creationist movement — as a step consistent with its infamous “wedge strategy” to gain a small toehold in science classrooms that can grow in the future — I also think the reflexive condemnation of the bill by scientists is ill-advised. I wrote about this bill a little over a year ago here. The text of the bill itself is important and relevant. There is little in it that is objectively troublesome. It does not mandate that the teaching of creationism be given “equal time” with the teaching of evolution or make any statement that would improperly elevate creationism to the status of science. Instead, it requires that teachers “be permitted to help students understand, analyze, critique, and review in an objective manner the scientific strengths and scientific weaknesses of existing scientific theories in the course being taught.” It goes on to assert that it “only protects the teaching of scientific information, and shall not be construed to promote any religious or non-religious doctrine.” Surely, any scientist must agree that these statements describe the process of scientific inquiry rather well. Why do scientists not see this for the victory that it is? Since 1925, when John Scopes was convicted of violating the Butler Act by teaching evolution in school, much has been achieved. Not only is the teaching of evolution no longer prohibited — although even that was not repealed in Tennessee until 1967 — court decisions have consistently held that creationism is not science (no matter what name it attempts to go by) and that the government cannot compel the teaching of creationism as though it were. Creationists have instead been reduced to needing to confront science on its own terms: through objective analysis, critique, and review. There is also a danger here that has not been fully recognized. An attempt to suppress even any mention of creationism in school science classes has the potential to set up science as appearing doctrinaire — this is already happening in other areas that are of more direct policy relevance such as global climate change. But science welcomes objective challenges to its ideas because addressing those challenges makes its ideas more robust. Our heroes, like Galileo, are those who tenaciously confront orthodoxy. Creationism remains so widespread a belief in the United States that students are still exposed to it outside a classroom. Creationists have devised arguments that are sometimes clever and subtle, and that can superficially appear to present genuine scientific challenges to evolution; students deserve to have their questions about how science responds answered. If those answers are not forthcoming in a science class, where do we expect students to become armed with the critical-thinking tools needed to identify and expose crafty but misleading pseudoscientific arguments? The debate is no longer one in which we are confronted with legislation that attempts to portray creationism as though it were science. If such legislation again rears its head in the future, it should be condemned and challenged, using the body of law that has now developed to oppose it. Instead, the debate has shifted to one in which creationism is to be addressed in terms that science not only welcomes, but thrives on — objective analysis and criticism. It is a mistake to be overly timid by appearing dogmatically to suppress any dissent to what is increasingly viewed as scientific orthodoxy. Doing so puts us in the position of failing to exploit the real strength of science: an acceptance that anything, on fair and objective grounds, can be challenged.